It depends on specific device and its architecture. Those that are built on top of Android, typically tend to get AOSP ports, e.g. Nook (here's Simple Touch instructions), or Kindles - the latter even has CyanogenMod ROM. Sony PRST 1 was hacked to expose full underlying rooted Android but I'm not sure if AOSP based ROM is available for it - this might be it. I'm not sure if there are any non-Android-based mainstream eInk readers - most of the ones I heard of (which is not a lot) seem to be Android under the covers and thus can be opened up (e.g. see Kobe Glo). There is a project, called PRS+, for older Sony PRS devices (PRS-300, PRS-505, PRS-600, PRS-350, PRS-650, PRS-950). KOReader is a document viewer for Linux based E Ink devices. Currently there are versions for Kindle, Kobo, PocketBook, and Android devices. The installation procedure depends on the device. Support forums are available on Mobileread. XDA Developers don't have the e-Ink Kindle, but they have a page for the Nook Touch. Check out the "Android Development" thread. Look to inactive project OpenInkpot (2, 3). There is a crowdfunding campaign for an e-ink device that says they will release the firmware as free software. We intend on making the firmware for the 13.3 inch e-reader available to the entire community. I have no affiliation with the campaign or the people behind it. Not the answer you're looking for? Browse other questions tagged e-ink ebook-readers firmware customization or ask your own question. 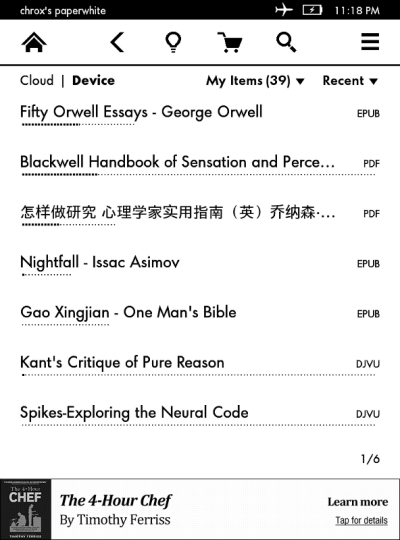 Are there any specific features that I should look for in an eBook reading application? Are there any ebook readers which are NOT backlit, but for which you can upload pdfs?